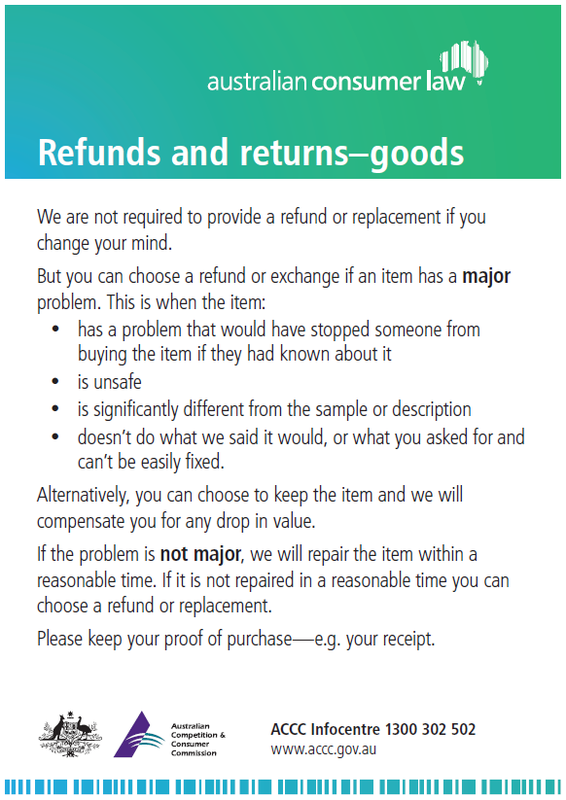 If you are not happy with your purchase, simply return the item to any Dimmeys store with your Receipt (or other proof of purchase) and we will provide you with an exchange, credit note or refund within the Australian Consumer Law guidelines outlined below to the value of the item returned (excluding postage). Please contact us describing the problem, and remember to quote your order number. We will contact you to arrange the return within the Australian Consumer Law guidelines outlined below. If the item is confirmed as Faulty, customers will be reimbursed for both the item and postage in the form of a Refund using the original payment method. Please note that all postage is to be covered by the customer for ‘Change of Mind’ returns. Items must be returned within 8 weeks from date of purchase and proof of purchase must be provided.